In 10 stories by Murray (Forgery, 2007, etc. ), historical figures adventure into new worlds largely because they feel excluded in their old ones. “Fish,” practically a novella, introduces and lays out the theme of outsider-turned-explorer in the story of Mary Kingsley. A meekly subservient Victorian daughter, she barely leaves her house until she is 29. Then using her health as an excuse, she travels to the Canary Islands. Soon she’s hiking into the African interior where no Brit has gone before. Murray focuses on Kingsley’s interior life, the fairies that bedevil her as she defies convention. 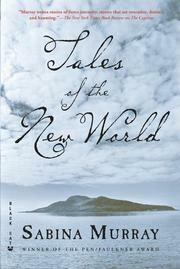 The stories that follow seldom display the same emotional complexity, although “His Actual Mark” comes close: In old age Edward Jon Eyre tries to reconcile the disconnect between his 1840 trek across Australia alone with a young aborigine, to whom he owes his survival, and his controversial fame for suppressing rebellion among Jamaican blacks 25 years later. “Paradise” probes the identity of Jim Jones of Jonestown infamy, and by extension other monster leaders from Pol Pot to Idi Amin to Hitler. The monsters of “The Solace of Monsters” are both whales and the whalers who hunt and fear them. Buccaneer William Dampier sails around the world three times, sometimes with the British government’s blessing. Readers may wonder if the young Jesuit who becomes Dr. Murray and travels to the Far East is the author’s father, but the story “Periplus” feels more philosophic than personal. Elsewhere, a self-proclaimed Venetian scholar sailing with Magellan chronicles the explorer’s wrongheaded choices even as he falls in love with him. A seer helplessly foretells the destruction of the Aztecs by the Spanish invasion. “Balboa” is a pig farmer escaping debt. And finally while visiting “On Sakhalin” and taking a fake census of the penal colony, Chekhov represents the storywriter as explorer and outsider both. Murray’s writing is chilly, but she is astute about the addictive nature of adventure and the unnerving relationship between the explorer and those he explores/hunts.